The parents brought their child to see the lineage holder, Shamarpa Khachö Wangpo, who immediately recognised him as the reincarnation of the Fourth Karmapa, Rölpe Dorje. When he was eleven or twelve years old, he was brought to Tsurphu Monastery and enthroned as the Fifth Gyalwa Karmapa. Khachö Wangpo presented him with all the possessions of his predecessor, and went on to bestow all the Kagyu empowerments, transmissions and teachings upon the Karmapa. It wasn’t long before Deshin Shekpa had easily completed his traditional training. During the lifetime of the Fourth Karmapa, Emperor Yung Lo of the Chinese Ming dynasty had a vision of the Karmapa as Avalokiteshvara. 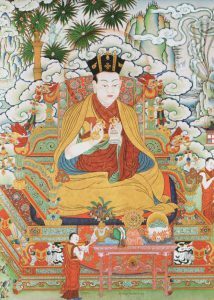 Although he subsequently invited the Karmapa to visit the Ming court, Rölpe Dorje declined and sent a lama as his emissary. However, at the age of twenty-three, Deshin Shekpa accepted an invitation from Yung Lo and embarked upon a three-year journey to China, where he was received by thousands of people. Emperor Yung Lo took the Karmapa as his guru and became a deeply devoted disciple. It is said that the Fifth Karmapa, on a number of occasions managed to dissuade the Emperor from imposing a single religious system, by pointing out the value of alternative systems, suited to different types of people. Almost certain bloodshed was thus skilfully averted by the Karmapa. The Emperor himself soon became an accomplished bodhisattva (in some accounts Yung Lo is actually regarded as an emanation of Bodhisattva Manjushri). The Karmapa responded to Yung Lo’s profound faith in him by manifesting a hundred days of miracles, such as lighting the clouds with iridescent colours and making flowers fall from the sky. The Emperor had these events recorded for future generations by commissioning a vast silk scroll with a commentary in five languages. This great scroll was one of the many treasures, kept in the Jokhang in Lhasa. One day Yung Lo experienced a pure vision in which he clearly saw the wisdom vajra crown above his guru’s head. He subsequently had a physical replica of the crown made and offered it to Deshin Shekpa, with the request that he wear it on special occasions to bring liberation to those who saw it. This was the origin of the Vajra Crown Ceremony. The Emperor also offered Karmapa the highest-ranking title of ‘Ta Bao Fa Wang’ (Great Precious Dharma King), presenting him with a golden seal. After his time with the Emperor, Deshin Shekpa made a pilgrimage to the famous Wu-tai Shan mountains, sacred to Bodhisattva Manjushri. He also visited the monasteries built by his predecessors and bestowed teachings on the people of China and Mongolia. He then returned to Tsurphu to assess the damage caused by an earthquake, and to oversee its reconstruction. Then he spent three years in retreat. Deshin Shekpa, passed into Parinirvana at the age of thirty-one or thirty-two. Having realised that his life was to be short, he had already left indications as to his next rebirth. Upon his cremation, many self-arisen buddha images and relics were found amongst his ashes. 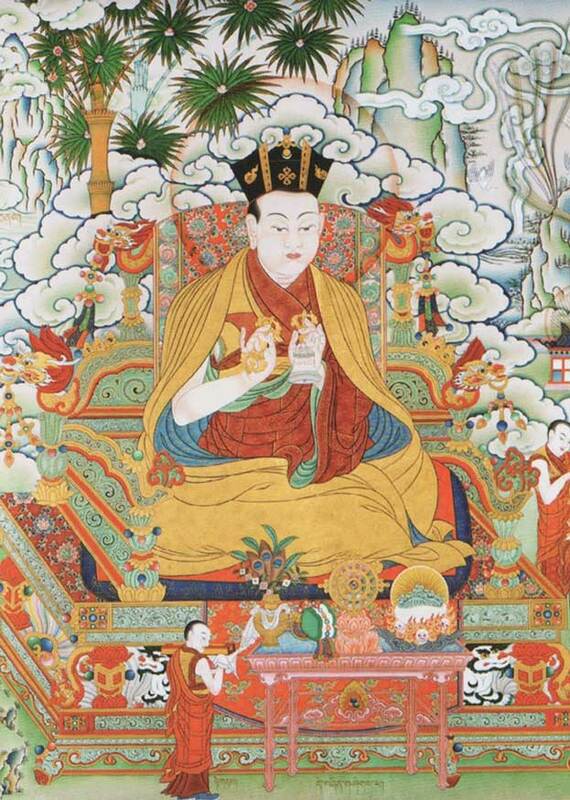 He had many disciples, including Zhönnupal, Lodrö Rinchen, Chöpal Yeshe, Lodrö Gyaltsen, Döndrub Öser, Shakya Zangpo, Maze Togden, and Chökyi Gyaltsen, though it was his closest disciple, Rinchenpal (Ratnabhadra), that would go on to inherit the lineage.